A few years ago we realized our sugar lift wasn’t lifting as well as we would like. We found the India ink we were using to be the culprit. We were using non-waterproof ink, but we thought there was likely an additive in it that was making it not entirely water-soluble, and consequently the “lift” wasn’t as complete or clean as we wanted. 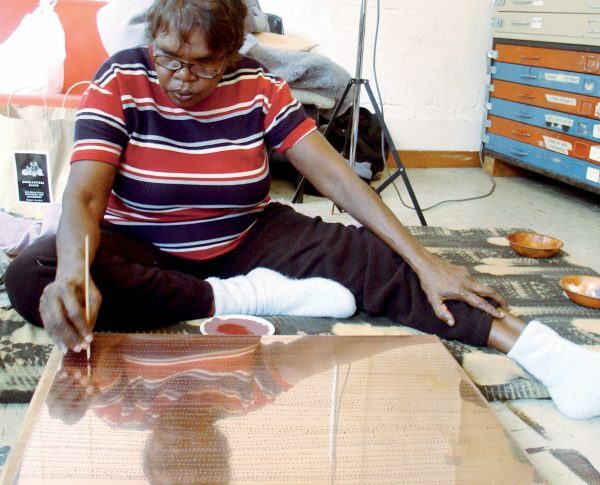 I remembered a photo of artist Dorothy Napangardi using an earthy red-tinted sugar lift mixture during our project with her in Australia, and thought to try using red oxide pigment in place of black India ink. The red oxide pigment is water soluble, making it a perfect substitution. Complete directions for mixing and using sugar lift can be found in our Crown Point book Magical Secrets about Aquatint. All the same principles and ideas apply to using this new iron oxide pigment. 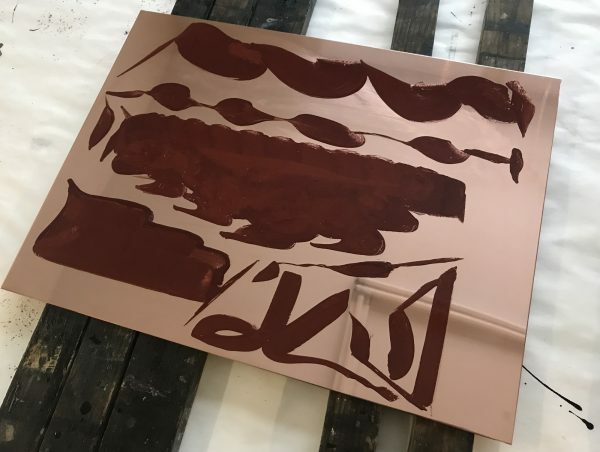 The only slight difference is that the red oxide pigment mixture isn’t necessarily as watery as the India ink so you may need to add water to your finished mixture to allow you to paint it onto the plate more smoothly. Alternatively, you can play around with bulking out your mixture with extra pigment to create a pastier and thicker sugar lift that’s more like paint in consistency. *Mix the iron oxide pigment with water to form a pigment-dense mixture. Dorothy Napangardi paints with sugar lift. You can see the small plate with the mixture on it. Red areas on the plate are the sugar lift mixture.